This item is available in 21 cover options. Click to view options now! The rolled and pleated arm panel, and dressmaker skirt lend this style the right amount of tailoring. The semi-attached back cushion is zipper accessible to maintain that perfectly tailored look. 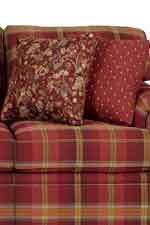 One toss pillow is included with the chair, and is available in the matching fabric or coordinating pattern as desired. The chair is a chair and a half, and is also available with a glider mechanism. This fabric upholstered storage ottoman has a dressmaker's skirt around its base that matches the pattern and style of the rich top cushion. Lift up the top seat to reveal the storage space inside the ottoman. The Clare Accent Chair and Skirted Ottoman by England at A1 Furniture & Mattress in the Madison, WI area. Product availability may vary. Contact us for the most current availability on this product. 5377-R Ottoman 1 41" 24" 18"
5374 Chair 1 50" 42" 36"
Arm Low profile padded rolled arm. Seat Back Comfortable cushioned seat back. Seat T-shaped padded upholstered seat cushion. Leg or Skirt Skirted base. 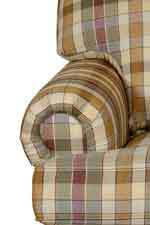 The Clare Series is no ordinary upholstery group. From the many options unavailable on most other styles to its ample size, this style is traditional at its best. Padded rolled arms, a skirted base, and comfortable seat make Clare the perfect addition for any home. Choose your favorite special order fabric to create a look that you are sure to love for years to come. Create the cozy environment that you want in your home with this collection of upholstered living room furniture. Warm, inviting, and comfortable, it all adds up to Clare. The Clare collection is a great option if you are looking for Traditional furniture in the Madison, WI area. Browse other items in the Clare collection from A1 Furniture & Mattress in the Madison, WI area.